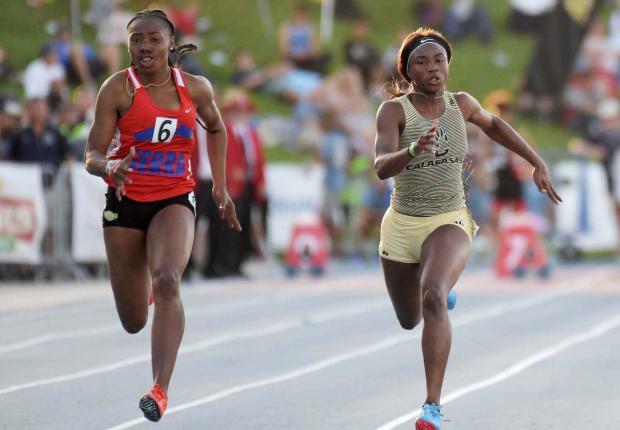 Who are the top returning sprinters in California? How do they compare with the past four years? We rank the fastest 15 then and now. What we find in the following pages is eight marks by returning boys that rank among the top 15 over the previous four years, but only five on the girls side -- four by just two girls (Deanna Nowling and Jazmyne Frost in Kirby Lee/Image of Sport photo above)! Note that fastest 15 returning sprinters are based off of 2018 PRs, regardless of conditions. The full rankings list of returnees is linked below each chart, accessible to MileSplit subscribers.